Puppies, Puppies and More Puppies !! Happy Easter from all of us at Powderhill Goldens! And boy have we got baskets of puppies to show you this week! We have updated our pictures of Luna's litter of Golden Retrievers, and we are please to introduce the first individual shots of both Sunny's and Willow's litter of F1 Standard Goldendoodles. Click the "Pups" link above to access the puppies pictures. And NOTE! We still have the # 5 & 6 Picks from Luna's litter and the #10 Pick from Sunny's litter available so call Janet for details!! Aray with her litter of five female and three male puppies. Thursday night, Araya delivered her litter of eight MultiGen Mini Goldendoodles. Both puppies and mother are doing very well. The litter is a spectacular array of hues including silver, chocolate and copper merles, solid chocolate and solid black/silver. There are five females and three males in the litter. The Puppy Pick Day for this litter will be Saturday June 1st and Puppy Go Home Day will be Saturday, June 15th. Photo Sessions from Rustic Pony! Today we are formally launching a partnership with Rustic Pony Photography. 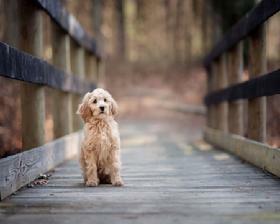 Rustic Pony's owner, Kayla Brouillard has years of experience in pet photography. The pictures above were taken just a week ago with a Powderhill Goldens customer's Goldendoodle. We have negotiated special discounts- available only to Powderhill Goldens' customers past & present - on Rustic Pony Photo Session Packages. For more details, click here to see details on our new Rustic Pony program. Both Karma and Harmony have been confirmed to be pregnant. 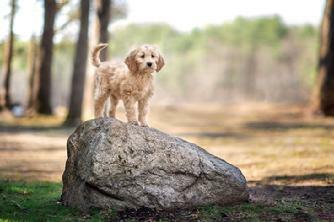 Karma should deliver a litter of F1b Mini Goldendoodles first, followed by Harmony's litter of F1b Standard Goldendoodles. Their puppies' go-home dates will be in July and we have a number of available picks for their litters! Karma was bred to Jack and Harmony was bred to Woody. Please call Janet for details and available picks on both litters. F1b's, by the way, are the most hypoallergenic of the Goldendoodle breed. These could be great dogs for families with allergy issues, doctors or school guidance counselors who want to bring their pet to work for their calming effect. Mardi was recently bred for a litter of F1 Minis. Besides a natural tie, she also had two separate AI sessions. We hope to ultrasound Mardi this coming week to confirm pregnancy. For information on any other upcoming litters call Janet at (860) 942-7889. We have two Guardian Home opportunities available for a litter of Golden Retrievers expected to be ready to go home in May, 2019. If you meet our criteria, this could be an opportunity to share ownership for the first three years, then own the dog outright, with the cost you paid reimbursed. If you would like more details, please call Janet at (860) 942-7889. VERY IMPORTANT: Just about every single Powderhill Puppy is sold before it is conceived. The likelihood of getting a puppy from us on just a week or a month's notice is less than 1%. 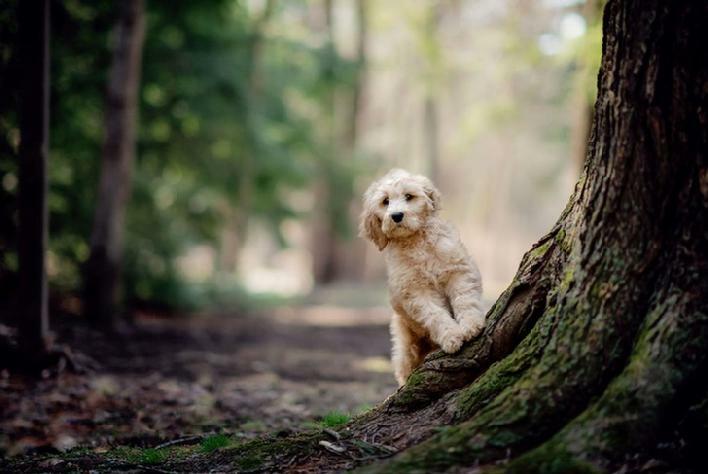 This is due to the huge interest in Goldendoodles, limited supply of puppies, and a large following of prospective and returning customers that we have enjoyed through our many years as a breeder. 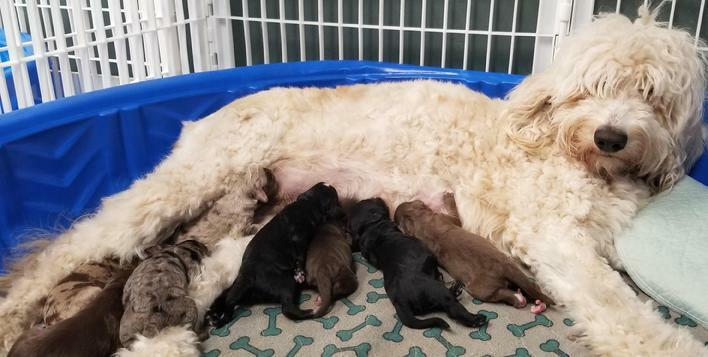 We do plan litters extremely far in advance so we are able to tell you what types of Goldendoodles (or, to a much lesser extent, Golden Retrievers) we are planning up to 24 months away. We can always provide the name of the litter's mother, but we usually do not select the father until we are close to the breeding time. We breed puppies throughout the year as our dams come into heat. People can call at any time to be added to any of the upcoming litters' waiting lists. If you wish to reserve a puppy from one of the available litters, you will need to send a deposit check for $500.. within a few days. The deposit is not refundable unless there is no puppy available, however the deposit can be used on any future litter. We take eight deposits on each litter. The first deposit received for a litter has first pick of the litter, the second deposit received gets the second pick, and so on. Note, Powderhill reserves the right to take the first female from any litter in order to continue our breeding operations. If there are not enough puppies in a litter to satisfy the eight people placing deposits, those not getting a puppy are offered their choice of moving up to the next round of litters with a better pick priority, or having their check returned. Our dams usually become breedable on a six month heat cycle. We do not decide when any of our female dogs goes into their heat cycle – they do, but it's usually every six months. Many times the lead female is followed closely by one or more of the other females, but this is not always the case. The dam is bred 10-15 days after her heat cycle begins..
At Powderhill, both dams and sires are health tested before being added to our breeding program. PHG reserves the right to substitute a different sire if necessary to enhance the potential for a successful litter. From the date of the first tie with the sire to the expected delivery date is nine weeks, but the delivery could take place up to 4-5 days before or after that date. After they are born we allow the puppies to bond with their mother for a period of four weeks. This allows the mother to concentrate solely on nurturing her pups. The mother is fed frequently and given plenty of quiet time with her babies. At three weeks of age, we microchip and begin taking weekly pictures of each individual puppy. The microchip will stay with them for the rest of their lives; initially allowing us to assure each owner that they have the right puppy, and later helping those owners to find them if they are ever lost or stolen. When the puppies are five weeks old we hold a Puppy Pick Saturday where the owners and their families can come to our locations to meet us, meet the litters and select their puppy. The owners of the first pick of the litter must come first, then the owners of the second pick, etc… It’s a great opportunity for pictures and a unique chance to treat your kids to one of life’s great pleasures. Each family is given thirty minutes to select their puppy. On week eight, the puppies are ready to go home and each owner determines a specific time to pick up their puppy and take him/her home. Besides a food sample and a bag of pine shavings, we provide a binder that includes the Puppy’s initial health records, instructions for registering the microchip, our written guarantee, care and feeding instructions, a new collar and their choice of a toy.